More than a dozen different audio recording studios in West Michigan help musicians, podcasters, broadcasters, show hosts, and others capture their sound on digital media, vinyl records, and sometimes even magnetic tape. 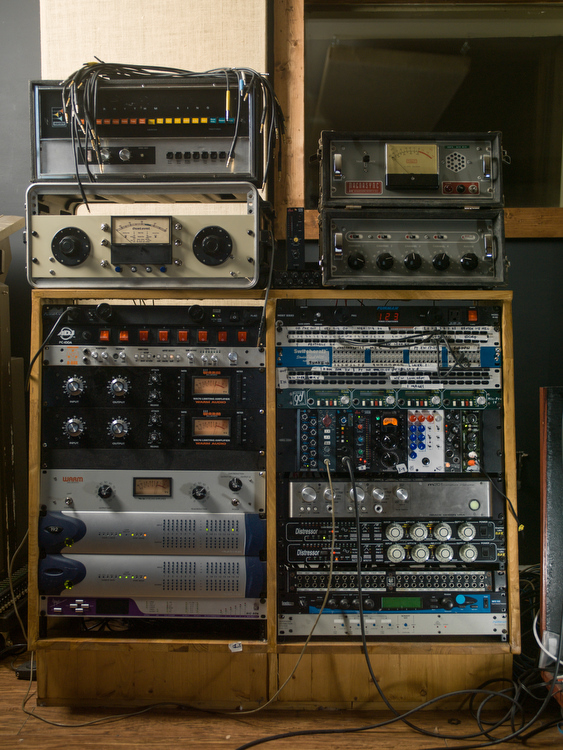 Within the Greater Grand Rapids area, there are more than a dozen different audio recording studios, each helping musicians, podcasters, broadcasters, show hosts, and others capture their sound on digital media, vinyl records, and sometimes even magnetic tape. Their work is fastidious, and often unrecognized, lest by tube amp and EQ aficionados who pore over albums with a well-tuned ear. From there, the recording might make its way to a record pressing facility, local and college radio stations, perhaps even someone's personal playlist. West Michigan is home to great examples of each. Yet, the distribution chain for audio recordings is vast, and even on a single platform, you may find different versions of the same piece of work. 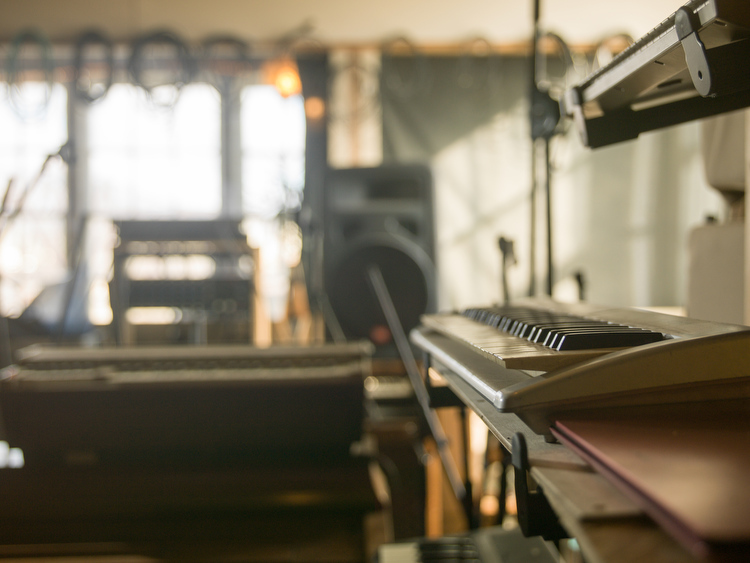 Keyboard instruments at Stone House Recording. No matter where you wind up hearing it, you know when it resonates. You listen to it again and again. It becomes the background music for your life, at least for a day or two, until you hear the next best thing. Chances are, it took more than a few tries to put that recording together. Even solo artists don't hit all the right notes on the first try, but they are still paying for studio time, no matter their talent level. Instead of holding out for a flawless performance, it's a lot more efficient and cost-effective to isolate the good parts from the bad in a series of takes, and stitch them together. Matching those pieces up, getting the timing and tuning right, and filtering out background noise are just a few of the responsibilities of a good audio engineer and sound studio. They also need to know how to work with musicians, and understand the soul of the sound they want on their record. When AC/DC came to Grand Rapids in 2000, they were touring for their album "Stiff Upper Lip." The band was entering the digital age, leaving analog behind. Sound engineer Tim Heldt helped Malcolm and Angus Young transfer their bass and lead guitar tracks from magnetic tape to digital files. A sound engineer of 25 years, and currently Associate Professor of Recording Technology at Grand Rapids Community College, Heldt was working with cutting edge equipment that few outside of his profession could afford, or understand. By today's standards, it wasn't even that impressive. The very first version of Avid Pro Tools, released in 1991, cost $6,000 and still only handled four tracks at a time, just like its analog counterpart for less than a tenth of the price. Transistors had revolutionized music, making the Roland 808 all but a household name. However, recording engineers were still beholden to limited processing power and hard drive space, both which have grown exponentially every since. In 1996, Pro Tools expanded its capabilities to 48 tracks, and paved the way for artists, at least those who could afford it, to create much more intricate and involved recordings. A few years later when AC/DC came to Grand Rapids, Heldt and his team were ready to push their sampling rate past 48 KHz, and beyond. Almost 20 years have passed since the "Stiff Upper Lip" tour. Malcolm Young passed away in 2017 after two more studio albums. And Pro Tools isn't $6,000 anymore. Rather, it's a $200 monthly subscription. Today, Heldt is helping future audio engineers learn about modern recording tools, and listening to the latest from fellow saxophonist Nelson Rangell (though "Back In Black" may get a few spins every now and then, too). Making music in Grand Rapids isn't just for Australians, of course. 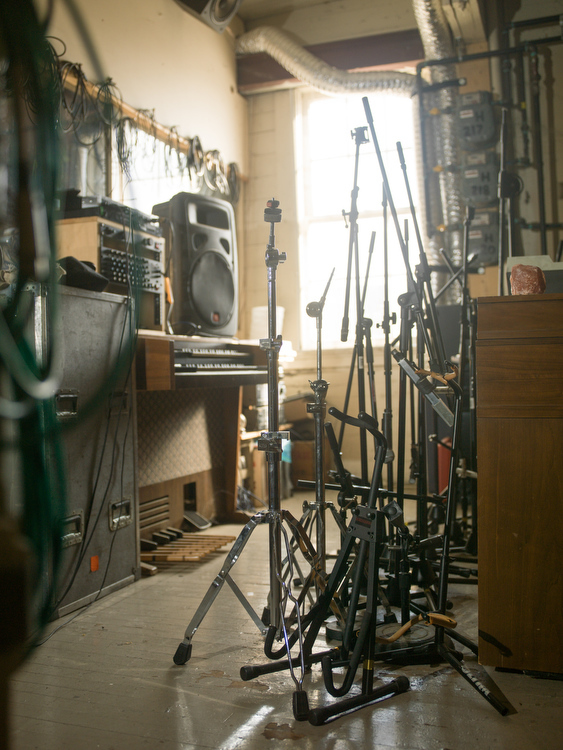 A lot of regional artists have recorded their sound in local studios, as well. 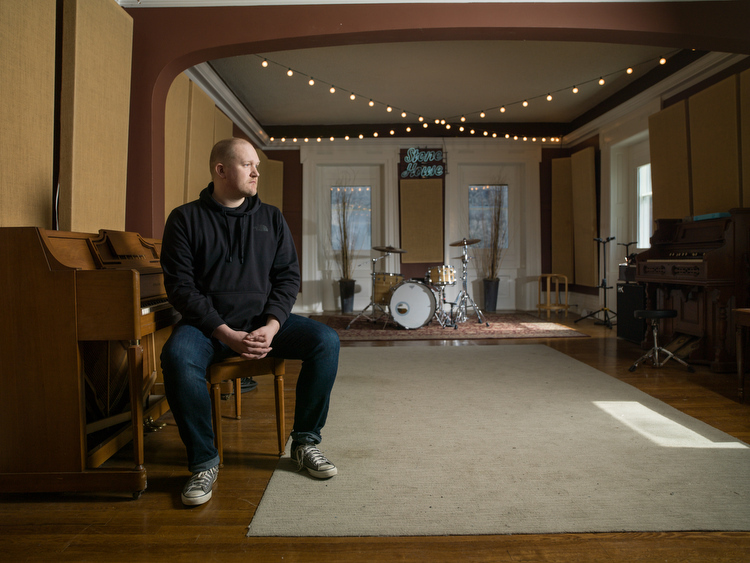 For Stone House Recording owner Josh Kaufman, the most exciting part of the process is guiding a song from its infancy to its completion. "Art makes life better," he says. Art also takes work; work that requires knowledge and experience. Kaufman started his career in Minneapolis. After graduating from The Institute of Production and Recording, he began working at Pachyderm Studios in Cannon Falls, MN, where he says he was lucky enough to work on "a beautiful Neve console and learned from some great engineers and producers there." Kaufman went on tour with Brian Setzer for about three years before joining his management company and record label. "I’ve bounced around the industry, which I think just gives me a well-rounded understanding of what artists are going through at every stage," he says. Stone House primarily works with bands or songwriters, many times attracting them by word of mouth, through the reputation built by founder Peter Fox. A recent renovation has brought a lot of new equipment into the studio, as well as comfort and productive capacity for artists seeking inspiration. Kaufman and Fox tailor their approach to each session based on the client and what they want to accomplish, "but mainly it’s about being easy to work with and providing high quality output," he says. The mixing board at Stone House Recording. "We take a bit of a hybrid approach to technology at the studio to accommodate the clients the best we can," Kaufman says. "We love the sound of analog compression, eq, reverb etc., so we have a lot of gear that is emulated in plugins." Of course, it doesn't hurt to rely on the real thing from time to time. 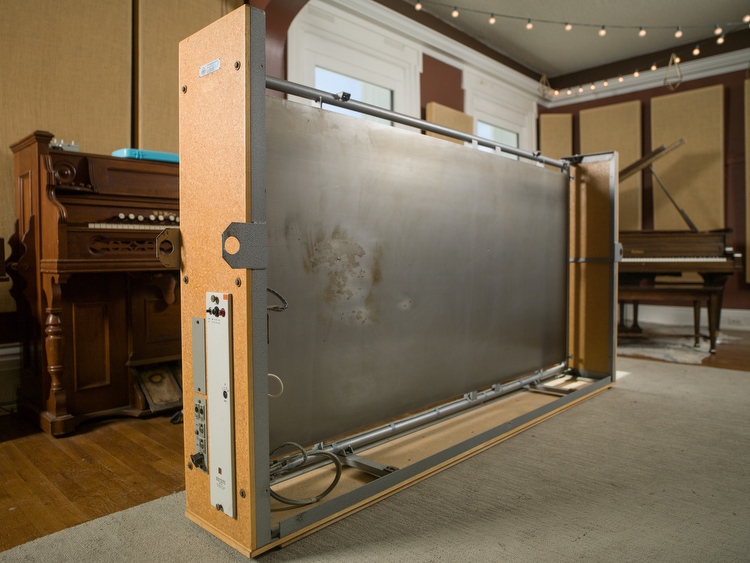 In some recordings, they make use of an EMT (Elektromesstecknik) 140 plate reverb, a 600-pound contraption consisting of an 8-foot long steel plate suspended on a steel frame. "It was a bear to get in the studio, but we think it sounds better than the plugin," Kaufman says. 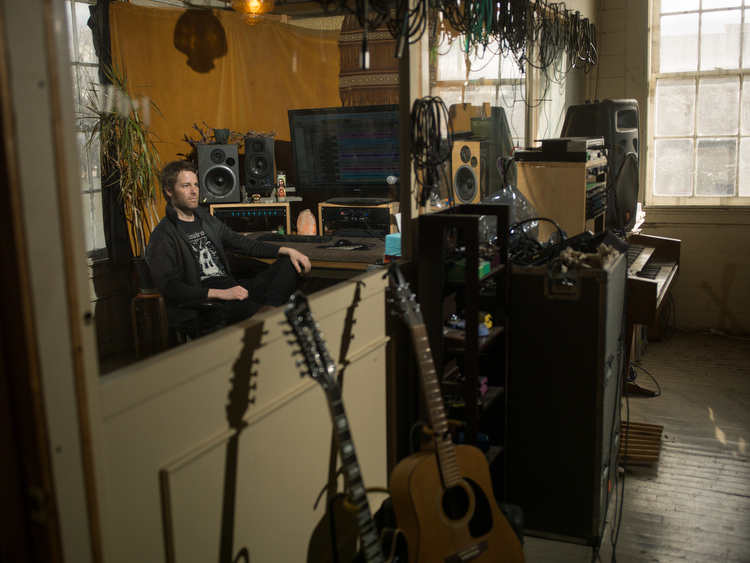 "Same with our compressors, eq's, the console we use; that’s just the way we like to work. But we also use ProTools and capture everything digitally because it makes editing much easier and allows us to be nimble with different client needs." For a commercial voiceover, the difference between a plugin compressor and a vintage tube compressor may not make that much of a difference. Being able to adapt and work with both ends of that spectrum helps engage and retain business. "We try to accommodate all needs here, but keep our focus on the creative side of recording music," Kaufman says. "There are realities of business that require being open minded about all sorts of projects, but generally we like to work on music that inspires us. Both Pete and I have our genres that we gravitate towards, but mainly we’re just looking to work with creative artists who write great songs." Many still hold fast to the idea that mass produced digital recordings still leave out something only found in the lo-fi warmth of vinyl. Kaufman isn't exactly in that camp. He sees the fidelity of digital and analog soon becoming indistinguishable, but worries the streaming industry is stifling new artists. "I think people will appreciate the difference in quality if they don’t have to change their listening habits, so lossless streaming, like Spotify has been experimenting with recently, will be a step forward in the general public appreciating a great sounding record," he says. "Mainly though, streaming has to figure out a payment model that doesn’t completely disrespect artists." As Heldt, Kaufman, and others agree, technology has greatly advanced the field of audio recording, but even ProTools plugins are no replacement for talent. Matt Ten Clay, owner of Amber Lit Audio, started off playing coronet in middle school, picked up guitar at 17, and joined a band with friends with friends at about age 20. “Being a computer geek and working at tech stores for four years also helped steer me into the more technical side of the band,” he says. Ten Clay has an associate’s degree in quality science from Grand Rapids Community College, which he says emphasizes the idea of continuous improvement. Like Agile and Lean methodologies have brought consistency and efficiency to manufacturing and product design, Ten Clay approaches recording and keeping up with technological advances in much the same way. He may be out of school, but he still does a little homework each day. Equipment at Amber Lit Audio. Ten Clay says he doesn’t seek out specific genres of music to record, rather clients come to him through word of mouth. Their creative goals may differ, but each business relationship begins with a open and honest conversation. Amber Lit has had a hand, as well as a few ears, in the making of recordings by Cabildo, Extra Texture, Mat Churchill, Radiator Hospital, and dozens of other bands and solo artists from around the region. The musicians who bring their work to Amber Lit Audio have already put a lot of time and energy into their music, and Ten Clay feels honored to be working with such driven artists. Being able to see them perform live at local shows is another understated perk of the job. “The journey of communicating and working together to achieve a desired result, or a result that finds itself, is an awesome endeavor,” he says. “The longer that one is in the game, the more you get to see musicians grow in their talents and ideas, which is really inspiring." Gigging for rent money is a noble profession, but stay in the business long enough, and you might actually start to make some money. Cold War Studios, led by Richard Johnson, was built on supporting that hustle. For the last decade, Johnson has been playing bass guitar for acts like Mustard Plug, Bomb The Music Industry, Wack Trucks, The Stitch Up, and his solo project, The Rick Johnson Rock and Roll Machine. The space and tools for recording at Amber Lit Audio.During a recently concluded three-week stint on the road, Johnson handled everything from sound checks, performance improvements, scheduling, booking events, and even playing some bass, after which he found time to share a little bit about his approach to both making and recording music. Johnson has been helping musicians record since 2004, and notes that engineering classes haven’t played too much of a role in preparing him for the job. He took a few classes in college that focused on electronic music and recording technology, but says he became disillusioned with institutional education, and later switched to graphic arts. What has proven most enlightening, he says, is everything else he’s learned from hands-on experience. He first taught himself music production on a Tascam 424 four-track recorder, followed by a Blackface ADAT in the late '90s. In this case, the expansion of technology has actually impeded progress. New file formats may provide higher resolution sound, but they also require more processing power: power that wasn’t necessarily available to everyone in 2000, and still takes a little extra hardware to manage in 2018. Producing music can be an expensive business if you want all the bells and whistles to sound their best, but for musicians who can’t afford to fork over several thousand dollars (a vast majority of new artists), bootstrapping is always on the setlist. 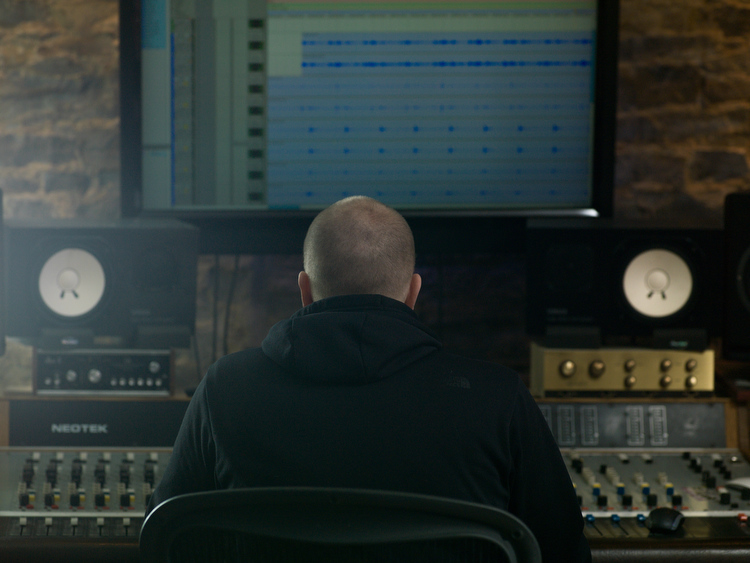 Whether you’re making a noise or trying to tame one down, there’s no shortage of exciting technology available to those interested in audio manipulation. Audinate’s Dante format, an uncompressed, multi-channel digital media networking technology, with near-zero latency and synchronization, is of particular interest to those in growing recording studios. 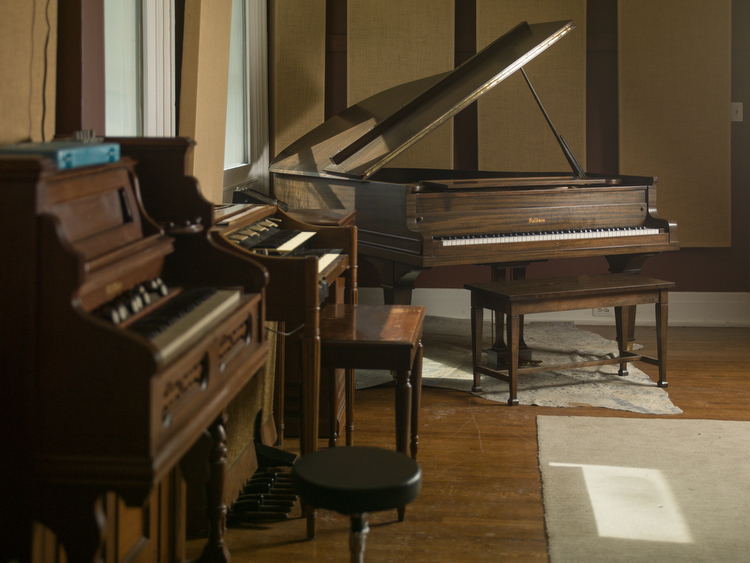 “That makes building a studio much more feasible and easy in terms of routing audio from room to room,” Kaufman says. Electronics manufacturers are also starting to cater to DIY audio engineers and music aficionados with more than just smartphone apps. With the help of an industrial designer (or even a cardboard box), and a handle on working with microcontrollers, one can build a relatively powerful digital-to-analog converter and bring the studio experience to personal headphones. Of course, plug and play equipment is much easier to get started with. The integrated circuit has forever changed the way people make and listen to music. Technologies like sound replacement, auto-tune, auto time-aligning, and other similar tools go beyond basic equalizer adjustments, but even these advancements lose novelty as they become more widely used. Finding a unique voice, a stirring riff, or the perfect beat is no longer relegated to the A&R factories of Capital, Decca, and Motown. We all have the means to make audible art, but making it stand out is a true science.